Swiss cheese is much in evidence at the show dairy in the hamlet of Pringy on the outskirts of the village of Gruyères in Western Switzerland. And I don’t just mean the vast wheels of the stuff in the maturing cellars. There’s lots in evidence in the twee on-site restaurant and most of all in the knick-knack laden gift shop. Back to the genuine article. Swiss AOC gruyère can only be produced in a relatively small area centred around Gruyères itself within the cantons of Fribourg, Vaud, Neuchâtel and Bern. The milk comes not from what I think of as a traditional Swiss light brown cow but from the black and white or reddish-brown and white Fribourg breed. Each cow eats an astonishing 100kg of grass per day and produces as a result just 25 litres of milk. The traditional 35kg round of cheese is made from a generous 400 litres of milk. At the show dairy, they work with vats holding 4,800 litres of milk to produce 12 cheeses at a time. 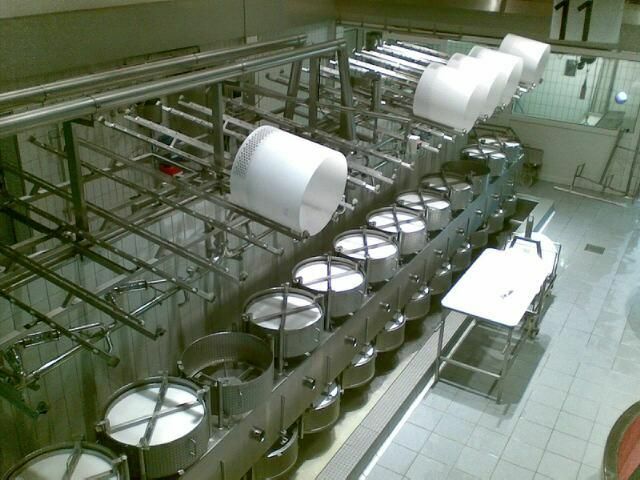 The morning milk is added to the previous evening’s milk (which has been stored overnight at a temperature of between 15 and 18 degrees C) before the cheesemaking process begins. Gruyère cheese is often described as unpasteurised, but as the museum visit makes clear, the milk is gently heat-treated (to 57 degrees C compared to the 71 degrees C of the pasteurisation process) during the production of the cheese. The milk (presumably skimmed to remove the luscious Gruyère crème double much fêted in this part of Switzerland) is first heated to 32 degrees C before adding a natural starter culture (lactic acid fermentation agent in whey) and subsequently animal rennet. The starter culture matures the milk and the rennet causes it to coagulate into a mass. The coagulated milk or curd is then cut using large blades into small pieces. Judging the exact moment to begin the cutting is reckoned to be the trickiest part of the whole process. The cut curds are then heated to 57 degrees C until the mixture becomes elastic and firm to the touch and the cut curds shrink to the size of small peas. At this point the whey is drained off and the curds ladled into moulds and pressed to form the virgin gruyère cheeses. 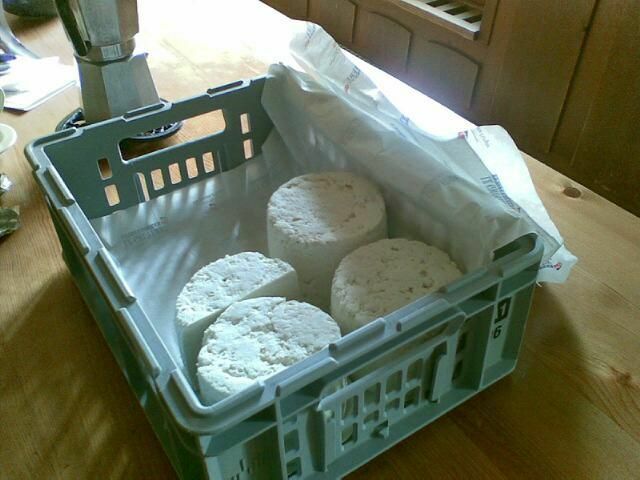 The fresh cheeses, vulnerably pliable at this stage, are soaked in a 20% brine solution which gives the cheese half of its ultimate salt content. Finally, the cheeses are placed on shelves of untreated pine (picea abies, the Norway spruce aka the Christmas tree) and left for a lengthy maturation process at a constant temperature of 13 to 14 degrees C. The cheeses are turned daily and brushed with salt solution as they mature. This no doubt used to be carried out by hand but the ever-ingenious Swiss have devised a robot to carry out this repetitive task. 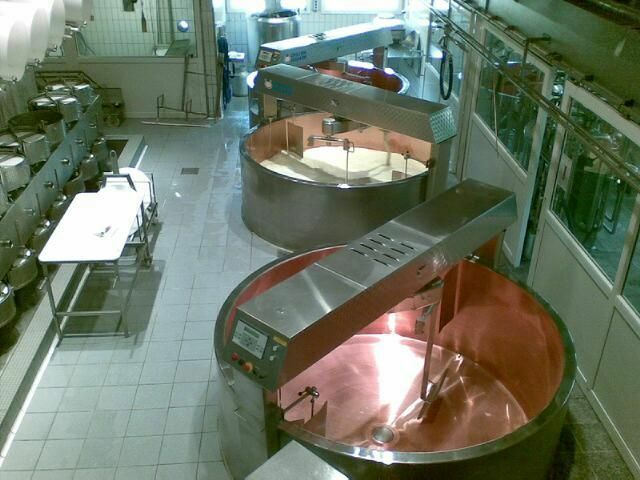 There is a certain fascination to be had watching the robot progress up and down the aisles of cheese. 5 to 6 months’ maturation produces a doux (mild) cheese; 7 to 8 months’ a mi-salé; 9 to 10 months’ a salé; +10 months’ a réserve; and finally 15 months’ a vieux. Older is not necessarily better in my book and I rather enjoyed the mild flavour of the youngest gruyère. Visiting the show dairy is a multi-sensory experience and helpfully you are given samples of 3 different ages of cheese to taste the difference. They become progressively more intense and savoury as they age. Ring the bell and the farmer’s wife will cut for you a wedge of authentic Gruyère d’Alpage. 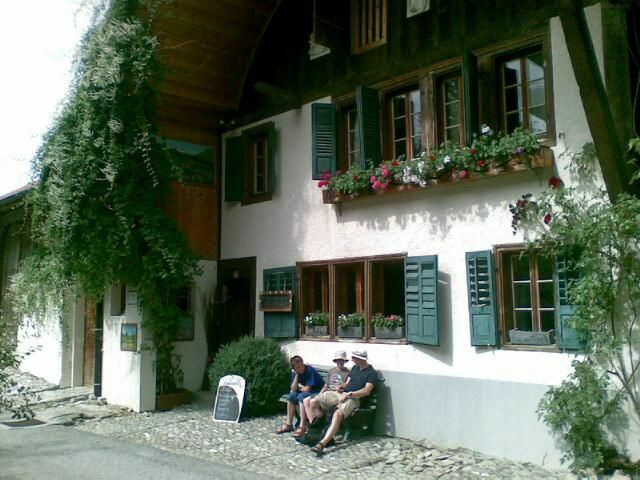 She also sells the fresh whey cheese known as sérac, a by-product of the gruyère cheese making process. This is what the local farmers used to eat themselves as the gruyère itself was far too lucrative a commodity for home consumption. I initially thought that sérac must be a marketing man’s invention to make a plain cheese more enticing with a mountain-themed brand identity. A sérac is, as any mountaineer will tell you, the name of the rough ice lumps that form when a glacier undulates. It transpires that it’s the other way round. The cheese was named sérac first, with a possible derivation from the Latin word for whey, serum, and the glacial formation was named after the cheese in a fit of whimsy. The farmer’s wife suggested eating the sérac as it came with salt, pepper and fresh herbs or using it as a cooking ingredient. I found a handy recipe for cooked sérac posted on the www.genevalunch.com website on 15 March 2010 by Jonell Galloway. 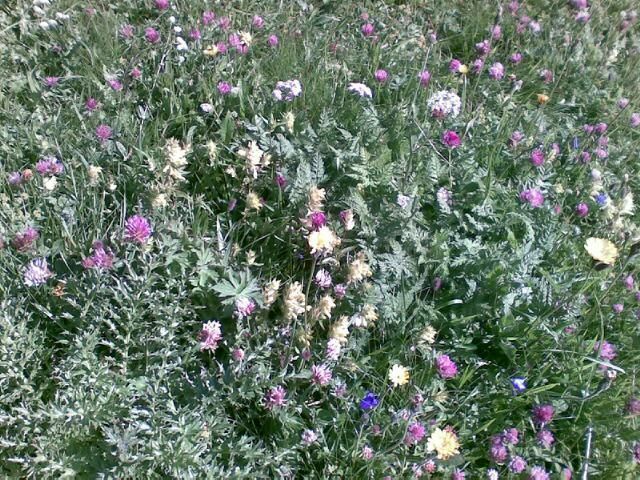 Finally, if all this sounds too touristy for you, how about a day’s foraging for wild plants in the lush Fribourg countryside? I saw an enticing little flyer for just such an adventure pinned up on the Maison de Gruyère noticeboard but didn’t have the time to take up the opportunity. The lady leading the foraging walks is Christine Brinkerhoff-Meier tel 00 41 (0)26 928 1429 ortieenfolie@hotmail.com. The tours run from 9.00 till 16.00 on Wednesdays, Saturdays and Sundays during the summer months. Just as the chocolate fest which Easter has become is finally over, L’Artisan du Chocolat go and open a concession in Selfridges Manchester store! Despite the name, L’Artisan du Chocolate is a British company founded by Gerard Coleman and make chocolates to die for. Like most people, I enjoy chocolate but wouldn’t call myself a chocoholic. These chocolates though are something else. I was first introduced to them by my friend Shelley who gave me a box as a new year gift two years ago. Now I make a bee-line for their Sloane Street store when I visit London. The good and bad news is that 1) I don’t have to any more as theyr’e much closer to home 2) they are both incredibly moreish and on the pricey side – but those two factors do cancel each other out. On display when I visited was this rather magnificent chocolate elephant. He’s not solid chocolate but apparently has a polystyrene core and is spray painted with real chocolate using car production line technology. Fancy that. I was immediately drawn to L’Artisan’s gleaming chocolate pearls – pearlised shells in white or dark chocolate with a soft ganache filling. If you buy a sufficient quantity, they package them in gorgeous little jewelry-type coffrets. I was only the market for a small quantity so had to content myself with a cellophane bag. Here are my precious purchases – the aforementioned pearls, a couple of bars in unusual flavours (white chocolate with saffron; dark chocolate with Darjeeling tea) plus a tasting box which I’ve been working my way through, one divine chocolate per night after dinner with a cup of espresso. Quality not quantity. Sof far, my favourites are the signature liquid salted caramel balls also the wondrous thin discs filled with either passionfruit coulis or apricot and tonka bean coulis. Selfridges food customers are rather fickle – the fresh fish and meat counters soon disappeared as did the cheese counter. Let’s hope Artisan du Chocolat can stay the course. And they’ve brought out a range of election chocolate buttons too bearing tongue-in-cheek slogans so you can stay topical and enjoy your chocolate at the same time. We’ve been coming to this area of France for the past 15 years now and I’ve managed to build up quite a little black book of food addresses. It’s time to write them down and share them which will be quite a magnum opus. If you happen to be staying in a gîte nearby, please don’t just rely on the supermarket but give these places a try. I’m going to start not with Fontainebleau itself but with Nemours and its nearby villages of Larchant and La Chapelle. After all Larchant is the village we’ve been based in for the last few years thanks to our friends Alex and Elin who’ve bought a house in the village. Nemours is a substantial market town on the Loing, a tributary of the Seine. Despite its castle and imposing church it’s a straightforward workaday sort of place not on the tourist trail and none the worse for that. The heart of the town is its marketplace. Perversely the twice-weekly market (Wednesdays and Saturday mornings – a good range of fresh food stalls) is no longer held here but in the Champ de Mars, an open area by the riverside. Next stop is Aujard Aufradet’s butcher’s shop also in the marketplace where you can have your meat prepared by a real craftsman. The guy is an absolute whizz with his boning knife and that fine string that French butchers like to use. And if you really do need a supermarket, your best bet is Carrefour Marché on the west side of town in the suburb of Nemours St Pierre. I like their brown Campagrain bread once I’ve had my fill of baguette à l’ancienne. The almond croissants they do are a breakfast treat but you need to get there early as they sell out fast. And if you are into foraging for wild food the nearby forest is awash with wild violets at this time of year. They have a shy but distinct taste and make a pretty addition to a salad – just be sure to leave out garlic in your salad dressing which will otherwise overpower their delicate flavour. One year I will definitely try my hand at crystallising some for cakes and chocolate puddings. Last port of call is the village of La Chapelle la Reine, a village in the midst of prairie-like fields on the plateau beyond Larchant. It’s home to an Atac supermarket, a convenience store and a couple of OK bakeries – useful when the Larchant bakery takes its weekly day off. There is a weekly market too but it’s sadly nothing to write home about. Clearly signposted from the main road on a handwritten chalk board is a farm shop selling potatoes and all your onion family requirements (onions, shallots and garlic). That’s it from the Forest of Fontainebleau for this year – I’ll continue with my shopping round-up after our next visit, Easter 2011. The grandeur of the building, the intricate carving throughout, the stained glass and the view from the belltower were all uplifting. Only the noise (I can’t bring myself to call it music) in the nave as we entered the cathedral marred our visit: a church service was in progress conducted by a guitar playing and singing group, loudly amplified and execrable. There was no-one attending the service but the performers themselves. More than a little self-indulgent. After a visit to the cathedral, the modern-day pilgrim can take refreshment at the Bistrot de la Cathédrale. Despite its proximity to the cathedral (No 1, Cloisters Tel 00 33 (0)2 37 36 59 60) this is no mere tourist trap but an outpost of Chartres highly regarded “Le Georges” restaurant within the Grand Monarque hotel (22 Place des Epars Tel 00 33 (0)2 37 18 15 15). In terms of regional specialites, local pâtisseries sell sweets called Mentchikoffs. These are praline in a crispy meringue coating and were invented in 1893 to celebrate the Franco-Russian pact of that year. The white meringue poetically represents Russian snow. There’s also Pâté de Chartres made from mixed game birds served either en croûte or from a terrine. Another speciality as is the French classic Poule au Pot (pot roast chicken). King Henri IV who famously wanted to put a Poule au Pot on every table in France was the only king to be crowned at Chartres hence the connection. I was mistaken in thinking that the green and yellow Chartreuse liqueurs are from Chartres – the liqueur is made by Carthusian monks in Voiron near Grenoble. The drink local to Chartres is the beer “L’Eurélienne”. Sadly there was no opportunity to drink some that day. So that’s almost it for my quick gastro-tour of Chartres. I think it would be a fantastic place to be whisked away for a weekend – wonderful architecture, places to eat and drink and not overrun with tourists. Your eyes are not deceiving you. These are sweet/savoury macaroons and the flavours on offer really are salmon, foie gras, blue roquefort cheese, and, to cap it all, tomato ketchup! This isn’t witty, it isn’t clever, it’s just yucky. You are currently browsing the Shops real and virtual category at The Rhubarb Fool.